"Artificial Intelligence" is arguably one of the most over-used terms in cybersecurity today and despite the potential, most organizations are in the dark about how best to apply it -- and more importantly, how to explain the results it produces. 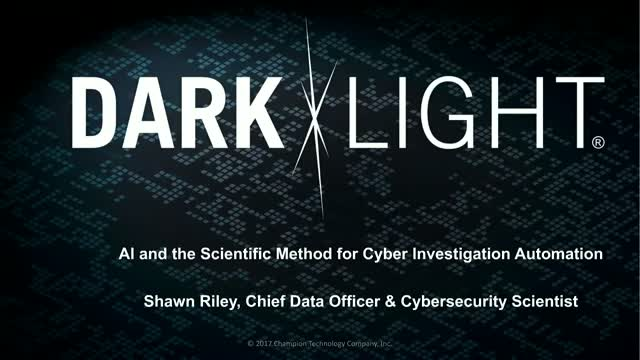 We will discuss how encoding expert tradecraft using scientific methods and common knowledge / data models - can produce AI with explainable results for improved investigation and an active cyber defense. media, information services and publishing, legal services, cybersecurity and beyond. Join security experts from Columbus Collaboratory to learn how to elevate your network’s cybersecurity defenses by identifying and remediating the most critical vulnerabilities. We will discuss best practices for vulnerability scanning, managing the seemingly overwhelming volume of scan data, data visualization techniques, and how combining vulnerability data, threat data and asset classification is critical to prioritizing your remediation efforts when resources are scarce and time is of the essence. This webinar, hosted by ITPG Secure Compliance and Certification Training, will be a practitioner oriented conversation about the latest Cyber-Security Standards of Practice and adoption models for CEOs and Information Security professionals . We will be joined by our guest contributor, Fred Cohen. Fred Cohen, in the mid 80s, created a Protection Posture Assessments methodology. It is available as open source in all.net and presents the Options and Basic components of standards of practice for enterprise information protection. The model provides overarching and specifics surrounding what we currently view as a reasonable and prudent approaches to addressing information protection for enterprises. ITPG Secure Compliance, a Cyber Security Boutique in Northern Virginia will be joined by Fred Cohen, to answer key questions for CTOs, CISOs, CIOs, Security Engineers, Analysts, and all other stakeholders interested in the topic of Cyber-security best practices. Fred Cohen has a long history of being ahead of the curve. He first defined the term "computer virus" and the invented most of the widely used computer virus defense techniques, led the team that defined the information assurance problem as it relates to critical infrastructure protection, did seminal researcher in the use of deception for information protection, is a leader in advancing the science of digital forensic evidence examination, and has been a top flight information protection consultant and industry analyst for many years. Along the way, he has started, grown, exited, and assisted in scores of companies, including Advanced Systems Protection, Mangement Analytics, Fred Cohen & Associates, Security Posture, The Radon Project, Fearless Security, TechVision Research, the Monterey Incubator, Can Do Funds, Angel to Exit, and many others. Identifying a user through fingerprints, facial recognition or iris scanning is simply not enough for today's digital age. Join us to learn about the shift from point-in-time identification to behavioral biometrics and how it is impacting today's workforce. Ehab Samy, Vice President of Product Management for Plurilock, will explore game-changing practices in continuous authentication and identity management to control access to physical spaces, applications, and government services. Data-driven integration between Phishing Sims and game-based information security awareness training. •Why Phishing Sims didn’t turn out to be the silver bullet to bring down the Human Factor problem in Information Security. •Root cause analysis: Why people fail, and how cognitive neuroscience of learning can affect much-needed behavior change. •The behavior modification cycle: The process, and why accurate skills assessment is essential. You will also see a quick demo of the integrated solution: “Keepnet Labs” and "Info-Sentinel" training mini-games. Q/A Session to follow. Mr. Aytun is a 30-year veteran of building technology-based solutions, including B2B product development for the TV broadcast industry, TV and video production, software product development, and in the last decade, game development for training and education. He has been serving the corporate and government training space as the CEO of MAVI Interactive since 2008. MAVI's key contribution to the training industry is making immersive skill development products accessible by all, removing the prohibitive cost barriers. MAVI's approach is to develop award winning immersive training systems with modular data structures that can reliably deliver engaging skill development scenarios as well as data-driven performance evaluation. All their solutions are based on Natural Learning Principles, designed to “train the brain” and affect behavior change. The scope of the 435 pages of the EU’s General Data Protection Regulation (GDPR) is vast and has raised the specter of excessive, unforeseen and unintended compliance consequences for companies around the world. In order to ensure individual privacy in the digital realm, there are numerous enterprise security requirements imposed by these regulations with significant compliance concerns, notification requirements and the potential for excessive penalties for non-compliance. Join Interfocus Technologies and security expert Richard Stiennon from IT-Harvest for an overview of GDPR’s implications on your security practices from a people, process and technology point of view. We will review the requirements for and processes to secure your endpoints, monitor and report on malicious user activity, and identify and trace where personal data resides in your network. Dark Cubed conducted extensive testing and determined that many IoT “smart home” device manufacturers have failed to implement basic security protections in the design, development, and production of their products such as electrical plugs, light bulbs and security cameras. Phishing continues to be one of the fastest growing and most malicious threats to the security of industries of every kind—from financial organizations to government contractors to healthcare firms. Today’s savvy phisher manages to evade even the most sophisticated technical safeguards through carefully planned, socially-engineered emails that are only getting more advanced. During this panel, we will discuss key findings from Wombat’s 2018 State of the Phish™ and 2018 Beyond the Phish® Reports. You will gain insight into current vulnerabilities, industry-specific phishing metrics, and emerging threats. This collection of data is taken from tens of millions of simulated phishing attacks sent through Wombat’s Security Education Platform over a 12-month period; data compiled from nearly 85 million questions asked and answered inside the CyberStrength® Knowledge Assessments and interactive training modules, responses from quarterly surveys of InfoSec professionals; and an international survey of working adults who were queried about social engineering threats and their cybersecurity behaviors. We will also discuss best practices related to security awareness and training. Our panelists will highlight key components and common threads of some of the most successful programs, and help attendees identify ways to apply new techniques and increase the effectiveness of their own cybersecurity education initiatives. Choosing cyber vendors and balancing budgets can be a challenge. We want to help cut through the clutter and show how we build a cybersecurity budget and identify spending needs an organization needs to immediately address. This is a two-part webinar series where you will learn how to approach the cybersecurity budgeting process (as well as see common mistakes to avoid) and how to build your own cyber budget. We will offer a budget plan worksheet to guide you along the way and share best practices and takeaways. Traditional security and authentication methods are designed to put up stumbling blocks for your employees, challenging them at several points throughout their workday to identify themselves. To do this they must enter, remember, and frequently change passwords, and in the expanding world of two- or multi-factor authentication the enterprise seeks greater security at the further expense of productivity. But traditional passwords and other authentication methods can be compromised, so the impact to your user processes does not always deliver proportional security. Artificial intelligence and biometrics can change the authentication game, supporting enhanced security by automatically identifying employee identity without impacting workflows and user processes. Join Ehab Samy, VP Product Management, to learn about applications of biometrics and Artificial Intelligence that smooth your employees’ path to completing any task at work. In early 2000, the Open Source Security Testing Methodology Manual (OSSTMM) was released with the primary objective of improving how the enterprise conducted security testing. Key sections of this methodology include operational, human, physical, wireless, telecommunication, and data network security testing. Today, OSSTMM is widely regarded as a methodology for penetration testing world-wide, offering a standard approach to conducting security testing. Frank Shirmo of ITPG Secure Compliance, a Cyber Security Boutique in Northern Virginia will be joined by Pete Herzog, the creator of OSSTMM, to answer key questions, and provide clarifications on OSSTMM for CTOs, CISOs, CIOs, Security Engineers and Analysts, and all other stakeholders interested in the topic of security testing. Join this webinar to hear from past students and current champions discuss how the SANS CyberTalent program is changing lives and closing the workforce gap. The cybersecurity workforce gap can be partly solved through increasing diversity. Organizations like SANS CyberTalent and the WSC are reaching into communities throughout Maryland and the US searching for professionals with technical appitude but new to cybersecurity. These academies are designed to help qualified veterans and women receive training and certifications to quickly and effectively launch careers in cybersecurity. The Immersion Academy is an intensive, accelerated program designed for completion in six to eight months, depending upon program selected. The program is at NO COST to the students selected. Artificial Intelligence (AI) is quickly gaining recognition as a viable method to increase successful problem solving, advance research in areas that exceed human capabilities and are automating menial processes to increase efficiency and productivity in expediential time. In the future, your interface with a human doctor may be limited, as AI gains more prominence in the medical industry diagnosing patients and determining levels of care. AI is being used to develop humanoids for companionship and is providing additional conveniences that are starting to alarm some organizations. There is a sense that the pace of AI is growing so fast that it may be impacting areas that are not getting the attention required to address various risks. Cybersecurity issues continue to arise regarding the integration of AI in computer systems, network and software platforms and the growing advances in IoT devices. As various industries invest in AI technology, CIOs, CISOs, researchers and manufacturers need to be working together to ensure cybersecurity and other safeguards are being considered in the design phase before allowing AI technology into the computing environment. Cyber has yet to be fully integrated into the suite of business functions and monitored risks within most organizations. GRC is the mechanism to align cyber and the business, but it’s current state is not sufficient. Governance hierarchy is ineffective (CISOs reporting to the CIO or COO), Risk leveraging ambiguous risk measurements, and Compliance mistaken as security. Moving forward, Governance must be redefined, making CISOs business leaders, reporting to the Board. Risk should leverage traceable data to measure in a common business language. Compliance should be the baseline for security initiatives, not the end goal. When these initiatives can be achieved, GRC will transform cyber into a business enabler. Jerry Caponera is the VP Cyber Risk Strategy at Nehemiah Security where he leads the effort to quantify cyber risk in financial terms. Prior to Nehemiah he founded PivotPoint Risk Analytics which focused on cyber risk quantification through value-at-risk modeling and simulations. Jerry has a broad background in cyber, having worked for incident response, malware analysis, and services companies. He has spoken at a number of conferences worldwide including ISS World MEA in Dubai, InfoSecurity Russia in Moscow, and TM World Forum in Nice, France. He holds an MBA from the University of Massachusetts, an MS in Computer Science from the University of Pennsylvania, and a BS in Electrical Engineering from the University of Buffalo. One of the more interesting-sounding job skills today is that of the “threat hunter.” Let’s talk about the activity of “threat hunting,” and deconstruct it a little bit. The idea behind threat hunting is to proactively look for adversaries and for traces of their activity. So, is threat hunting all that it’s cracked up to be? Is looking for trouble really the best approach today? It’s very possible that the one key element of threat hunting is one fundamental assumption: That you’ve already been hacked, but you just don’t quite realize it yet. In this presentation, James will discuss the benefits and drawbacks of “active defense,” and where it fits in with other security activities. Security operations face intensifying pressures along numerous fronts, including a constantly shifting threat landscape, an increasingly complex environment to defend, and an extreme shortage of skills. This panel of distinguished security experts will discuss the role that competitions – at the primary school, collegiate and professional levels – can play in attracting workers to the security arena, growing their skills, and developing methods to identify and defend against the greatest threats and risks of the day. Lisa Jiggetts, the Founder & CEO of the Women's Society of Cyberjutsu, one of the fastest growing nonprofits dedicated to women in cybersecurity, will spearhead this panel of experts is cyber security and competitions. Other panelists include Mika Devonshire, Director of Forensics and Cyber Risk Analytics at SSIC; Marcelle Lee, Threat Researcher at LookingGlass Cyber Solutions; and Dan Manson, Professor of Computer Information Systems at Cal Poly Pomona. The prolific outburst of IoT devices in our lives has become a boon or a curse. Boon as they make it easy to interact with "Things" and Curse as they make it easy for hackers to invade our privacy and breach security. Implementing Security in IoT devices is still after thought.This webinar looks at the challenges of securing IoT devices against threats and discusses about the options available to secure these devices. GDPR is a huge topic, with issues ranging from "What does it mean to my business processes?" to "Do I have to care about it?" And that's besides the technical bits! Together, let's explore what it means for a sample company. We'll discuss data, geography, and business processes. You'll learn about some of the pitfalls, and some of the opportunities inherent in GDPR. And maybe we can make it work for you, instead of causing a headache. Want to find out? Just show up. Joshua Marpet is an accomplished speaker, long time information and physical security practitioner, as well as a start up CEO and serial entrepreneur. He has presented on topics ranging from Facial Recognition to National Security, to audiences from government agencies, law enforcement, Fortune 5 companies, and many others. His research encompasses Digital Forensics, business security maturity, and how not to start an information security business! Joshua has been in the hot seat, at all levels of IT and Infosec. From the Federal Reserve, to law enforcement, to being an entrepreneur, Josh has been there. Let's talk.